Looking out over the azure of the Atlantic ocean, The Sao Rafael Suites Hotel is the pinnacle for golfers heading to the Algarve for a golf break in the sun. Combining an unbeatable coastal location with 5-star luxury and championship golf courses, this hotel is the first choice for thousands of British golfers every year. Boasting rooms that are both stylish and comfortable, Sao Rafael is the ultimate place to stay for groups looking to make the most of the All Inclusive offerings. The gorgeous Sao Rafael Beach is only a 5-minute walk away, with the nearest nightlife in Albufeira only 7 minutes in a cab. Being in the heart of the Algarve means that Sao Rafael Suites is extremely accessible, simply make the short flight to Faro Airport, from there it is just a 30-minute drive to the hotel. When it comes to golf courses, you are spoiled for choice in the Algarve, however, NAU Hotels own three of best; Salgados, Morgado and Alamos, all accessible via the hotel's complimentary shuttle service. When you are not teeing it up there are an array of excellent facilities at the hotel for guests to enjoy, including; four pools, a sauna, restaurants and bars. All units have large private balconies overlooking either the gardens or the ocean, and are equipped with air-conditioning, flat screen satellite televisions, mini-bar and safe deposit box. 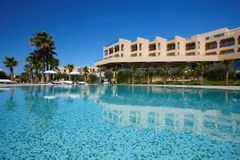 The hotel has excellent facilities, and is surrounded by beautiful Mediterranean gardens, all of which help to make it a fantastic place to base your next golfing holiday in the Algarve. The Sao Rafael Suite Hotel is partnered by three excellent golf courses: Salgados Golf, an excellent links course, is nearby, plus Morgado Golf and Alamos Golf. In addition to the beautiful Sao Rafael Beach, guests at the hotel can take advantage of the spa, whose specialist treatments include hot stone massage therapy, as well as the jacuzzi, sauna, and Turkish bath. There is a tennis court and four swimming pools, including one indoor, while the fitness centre is equipped with a great selection of cardiovascular training machinery and free weights. The hotel has its own buffet restaurant, and also a fine a la carte dining room. Restaurante Ramires, in nearby Albufeira, is the spiritual home of Portugal's signature dish - chicken piri piri, having been serving the classic since 1964! Chill out at the seaside with a drink or snack at the Sao Rafael beach bar. Try Caldeirada, a special fish stew that sums up perfectly the fantastic flavours of traditional Portuguese cuisine. Lovely, spacious room. Good pool areas with plenty of loungers. Food and drinks were not 5 star quality. My friend and I had a 3 night stay and 2 rounds of golf. The trip was brilliantly organised by Yourgolftravel from start to finish. The transfers to the hotel and the golf transfers went like clockwork. I will definitely use your golf travel again in the future. Good hotel, very clean, friendly and efficient staff. Only down side is its stuck in the middle of nowhere, a £10 cab ride to town. Really good hotel, the only downside was that for a mixed group of golfers the suites have two double beds and separate bath/shower rooms but you have to walk through the first bedroom to get to the second so privacy is an issue. Very nice room, Eatalian restaurant was a little disappointing. Slight problem with some lost property which was eventually resolved after we contacted Yourgolftravel.com. This is a great hotel with all anyone would need at your disposal The food is totally fantastic, for breakfast you would find it hard to think of anything they have not got all displayed in a perfect condition - all the foods were just perfect and met with everyones tastes first class. The drink selection was also good and as a all inclusive money is something you really did not need at the hotel. Very good certainly worth another visit. The hotel was very good, rooms plenty big enough with sensational soft beds and pillows. food good if not repetitive and bar area not very big but drinks selection very very good. Our stay this year was excellent. The weather was perfect, hotel brilliant, selection of food was as always first class. Golf at Salgados and Morgado courses was most enjoyable. The only small complaint was the long wait at Faro airport for the transfer to the hotel on the 18th September. At least half an hour before the driver turned up, and that was after I phoned the office to find out what had happened to our driver. Very clean and with staff that could not be more attentive. Nice pool area and entertainment in the bar each evening. Hi Ian Our stay at Sao Rafael suites was a most enjoyable experience.From our arrival to our departure the staff were very helpful and friendly. The food was fantastic and available throughout the day and evening.The rooms were roomy and comfortable. My caddy tip: "Keep on the fairway, play safe. " My caddy tip: "Be patient, chances to score will come." My caddy tip: "Keep away from the water." My caddy tip: "Keep on the fairway "
My caddy tip: "Enjoy, it is a fantastic course." My caddy tip: "Keep straight & out of the water. Enjoy the course"
My caddy tip: "Can't remember specific holes but they were all good, very hilly so get a buggy "
My caddy tip: "All very nice, but take lots of balls." My caddy tip: "Know how far you hit your clubs"
My caddy tip: "Be straighter rather than long"
Great place. Would definitely go back. My caddy tip: "Get a buggy"
My caddy tip: "I would imagine if it's windy it's very tough"
My caddy tip: "Be straight"
My caddy tip: "Be straighter"
My caddy tip: "Keep straight & out of the water"
My caddy tip: "Use the hills wisely"
My caddy tip: "Dont be afraid of using driver"
No particularly sparkling holes. Hotel was only OK, even though it was all inclusive. The Hotel did not know what bain-maries were for. The hot food was always left on bain-maries which were not switched on. I complained numerous times but no one listened. All three courses were excellent. Salgados was by far the best but very hard for a high handicapper! If you cannot hit straight, you may find it frustrating. Hotel is lovely (if a bit soulless) and too remote, but well organised for golf. My Caddy Tip - Leave your driver in your bag on Salgados. My Caddy Tip - Play the course. Can't pick a favourite hole and I enjoyed them all. Hotel was fantastic. My Caddy Tip - Play to your handicap. Hotel was good but had no swimming pools open. The first 2 holes on Los Alamos were excellent with plenty bunkers to play out of. The last 2 on the Morgados were excellent and had a very difficult par three followed by a long par 5 with lots of bunkers to contend with. My Caddy Tip - Play short on Los Alamos 17th. Salgados is the best of the 3 courses and near the hotel. Lots of water so need lots of golf balls! My Caddy Tip - Just enjoy the sunshine and the course. Very friendly staff at the hotel and the suites are excellent. My Caddy Tip - Watch the driver as you can run out of fairway occasionally, especially at Salgados. 3rd hole (par 5 tornado) was superb! Hotel and staff were first class. My Caddy Tip - Steer clear of the water hazards.